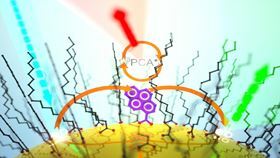 Scientists at NC State have found that pyrenecarboxylic acid-functionalized CdSe quantum dots undergo thermally activated delayed photoluminescence. Image: Cedric Mongin. Researchers from North Carolina State University have found that the transfer of triplet excitons from nanomaterials to molecules creates a feedback mechanism that returns some of the energy to the nanomaterial, causing it to photoluminesce over long timescales. This mechanism can be adjusted to control the precise amount of energy transfer, potentially making it useful for optoelectronic applications. Felix Castellano, a chemist at NC State, had previously shown that semiconductor nanocrystals could transfer energy to molecules, thereby extending their excited state lifetimes long enough for them to be useful in photochemical reactions. Together with Cédric Mongin, a former postdoctoral researcher who is now an assistant professor at École Normale Supérieure Paris-Saclay in France, Castellano then went on to discover there is even more going on than he originally realized. As reported in a paper in Nature Chemistry, the researchers have shown that not only does the transfer of triplet excitons extend excited state lifetimes, but some of the energy gets returned to the original nanomaterial in the process. "When we looked at triplet exciton transfers from nanomaterials to molecules, we noticed that after the initial transfer the nanomaterial would still luminesce in a delayed fashion, which was unexpected," says Castellano. "So we decided to find out what exactly was happening at the molecular level." Castellano and Mongin utilized cadmium selenide (CdSe) quantum dots as the nanomaterial and pyrenecarboxylic acid (PCA) as the acceptor molecule. At room temperature, they found that the close proximity of the relevant energy levels created a feedback mechanism that thermally repopulated the CdSe excited state, causing it to photoluminesce. Taking the experiment one step further, the researchers then systematically varied the CdSe-PCA energy gap by changing the size of the nanocrystals. This resulted in predictable changes in the resultant excited state lifetimes. They also examined this process at different temperatures, yielding results consistent with a thermally activated energy transfer mechanism. "Depending on relative energy separation, the system can be tuned to behave more like PCA or more like the CdSe nanoparticle," explains Castellano. "It's a control dial for the system. We can make materials with unique photoluminescent properties simply by controlling the size of the nanoparticle and the temperature of the system."